WASHINGTON (NNPA) – Increasing the minimum wage to $10.10 by 2016 would lift nearly 1 million low-wage workers out of poverty, according to a recent report by the nonpartisan Congressional Budget Office (CBO). Although a majority of low-wage workers are White, people of color would be disproportionately affected by an increase in the minimum wage. 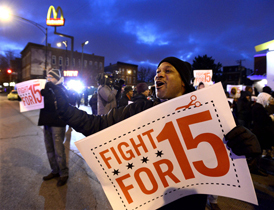 Blacks work in low-wage jobs at higher rates than Whites, according to federal statistics. Blacks account for 11 percent of the workforce, but 16 percent of workers that would see their wages increase. Families living below the poverty line will get a $5 billion bump in their income, about 20 percent of the estimated $31 billion. Roughly a third would go to families making three times above the poverty line. According to the Census Bureau, more than 27 percent of Blacks live in poverty compared to less than 10 percent of Whites. Nearly 40 percent of Black children live in poverty. According to the CBO report, raising the minimum wage would affect low-wage workers in two ways. some of those families would see their income rise above the federal poverty threshold,” stated the report. Although the CBO report suggested that up to a million jobs could be lost, if the minimum wage were raised to $10.10 per hour, many economists agree that the effect of wage increase would be minimal. “In a review of over 60 studies that look for statistical linkages between minimum-wage increases and job losses, economist John Schmitt reports that the most accurately measured results cluster around zero: some studies find that raising the minimum wage has a small negative effect on employment, a smaller number find that it has a small positive effect, and most find no significant effect,” stated a report by the Center for Budget and Public Priorities. In January, the Economic Policy Institute advocated for increasing the minimum wage to $10.10 in a letter to President Obama and Congress. More than 600 economists, including seven Nobel Prize winners signed the letter, according to EPI. Keeping his promise to use his pen or phone in a year of action to help American families, last week President Obama signed an executive order to raise the minimum wage of federal contract workers. In a policy brief detailing President Obama’s executive order raising the minimum wage for federal contract workers, White House officials cited a study that showed when Maryland passed a similar law for state contract employees, competition between companies increased, driving a higher quality of service. Contrary to common stereotypes most low-income workers are not teenagers working for extra pocket change for clothes and fast food on the weekends. According to a report by the Center for Economic and Policy Research, titled “Low-wage Workers Are Older and Better Educated than Ever,” the average age of low-workers is about 35 and only about 12 percent were teenagers in 2011. A majority (60 percent) of low-wage workers are 25-64 years old. More than 30 percent of low-wage workers have some college education and roughly 10 percent have a four-year college degree. The CBO also found that employment prospects for high school dropouts and Blacks in their 20s would be largely unaffected by changes in the minimum wage. Lawrence Katz, an economist at Harvard University, said that raising the minimum wage would have significant benefits for low-skill workers, especially Africa Americans. “Our best estimates suggest essentially no impact on employment and a large improvement in wages for disadvantaged workers,” said Katz.